Over the past several years, Derryfield has placed a growing emphasis on expanding our small but vibrant community of international students. Thanks to the efforts of Associate Head of School Susan Grodman and Director of Enrollment Kathleen Rutty-Fey, the School has fostered a strong partnership with New Oasis International Education, which has brought a number of students from several cities across China to live with local host families during the school year and engage with all facets of life at an American high school. The success of the New Oasis partnership inspired yet another partnership, this time with the ASSIST program. Founded in 1969, ASSIST is a non-profit institution that operates in twenty countries around the world. 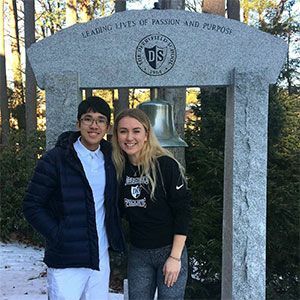 According to their website, ASSIST “matches academically talented, multi-lingual international students with American independent secondary schools.” For the first time in School history, Derryfield welcomed ASSIST scholars Nam Vo of Ho Chi Minh City, Vietnam and Karla Meschkat of Heidelberg, Germany to the Class of 2020 for the 2018-2019 school year. Nam and Karla wasted no time in immersing themselves in the Derryfield community, and they presented the highlights of their experiences at a recent Community Meeting where they took turns sharing pictures and anecdotes of their time at the School. Nam later said that he was inspired to study abroad due to his curiosity and desire to try something new. Once he arrived in America, he realized that the opportunity was“a great chance to be independent, undergo a top educational system and above all, forge some friendships that would last a lifetime (hopefully! ).” Karla was similarly motivated by the challenge of a new experience, and ultimately she says that when a close friend who had spent time in the U.S. shared her “amazing memories about close friendships and fun activities like prom,” she was convinced to apply for ASSIST. Derryfield is incredibly lucky to have Nam and Karla bring their positivity and diverse perspectives to the School community. The future of our international partnerships is bright, and we look forward to welcoming additional ASSIST scholars in the years to come.